Article first published as Review: Game (2011) on Technorati By Me. 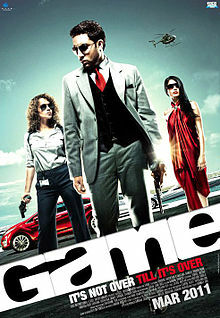 Game by Abhinay Deo (the same director of Aamir khan's Delhy Belly) falls much lower than expectations. Abhishek claimed that the movie will click even in world cup fever throughout India. Alas! The movie is merely a spoof of good thrillers of mid 70's of Bollywood with exotic locations, Sylish cinematography and efficient star cast. The film vastly fails in terms of story and screenplay.The real spirit of a thriller is missing here. Or say the soul is missing in the film. Except Kangna Ranaut And Abhishek Bachan the rest of the cast is strictly okay. Even Anupam Kher and Boman Irani seems wasted here. The editing is lousy. Within few minutes, you get troubled and puzzled. Even the second half is boring which rarely happens in the case of a thriller. Cinematography by Kartik Vijay is mind blowing and one of the few positive aspects of the movie. The style quotient in the movie is due to him. Althea Delmas Kaushal is the name behind both the departments. And he has failed miserably. Screenplay is rather confusing than interesting. Story is okay. Some twists and turns are very well projected but badly conceived by the director. The dialouges by Farhan Akhtar are good. Another weak factor. Not a singe song is hummable.Shankar - Ehsaan - Loy needs to rediscover them. My overall summation of this film is that it's exactly opposite than the tag line: "It's not Over 'till it's Over" - it's a Game over for this stylish thriller.